Citadel Miniatures Limited is a company which produces metal, resin and plastic miniature figures for tabletop wargames such as Warhammer Fantasy Battle and Warhammer 40,000. In the past Citadel Miniatures was a separate company but it has become a brand for Games Workshop miniatures. Although its models are used for the wargaming hobby, the painting of its miniatures (and miniatures in general) is a hobby in itself. "Games Workshop and Bryan Ansell have got together to keep-alive Citadel Miniatures, a new miniatures company that will be manufacturing several ranges of figures. Ral Partha are already in production, but Citadel will also be producing own ranges, including the Fiend Factory figures, Fantasy Adventurers and Fantasy Specials. Citadel will not be limiting production to SF/F figures, but also new ranges of historical wargaming figures". The following issue of White Dwarf contained the first advertisement for Citadel's forthcoming figures. Originally miniatures were produced using a white metal alloy including lead, although in 1987 Citadel began to produce plastic miniatures as well under the name "Psychostyrene" and "Drastik Plastik". These were made of a harder plastic than other plastic miniatures at the time and allowed for greater detailed sculpting. Citadel has continued to produce white metal miniatures as the economics of plastic make it only suitable for large runs. Some models are a combination of both materials, with the arm-less bodies and heads metal and the arms, weapons and other accessories plastic. In 1997 Citadel switched to a lead-free white metal because of concerns about lead poisoning, particularly in children. Most of the models created by Citadel require some form of construction after purchase. With smaller models this usually involves attaching arms, weapons and the base. Larger models come in many pieces and require more construction. From 1979 to 1984 Citadel had a reciprocal distribution and manufacturing deal with Ral Partha to bring each other's products to Britain and North America respectively. Chronicle Miniatures was a competitor run by Nick Lund and bought out by Citadel and they continued to operate under that name for a time. Iron Claw Miniatures were a range of miniatures designed, manufactured and distributed by Citadel in 1987 and 1988 and sculpted by Bob Olley. 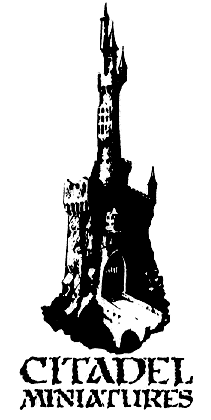 Many of the designs were later incorporated into the main Citadel range. Marauder Miniatures was a separate company set up by two former Games Workshop/Citadel sculptors (Aly and Trish Morrison) in 1988 and promoted alongside Citadel Miniatures in White Dwarf. The miniatures were cast and distributed by Citadel, and the company was absorbed into Citadel in 1993. Over the years, as well as producing their own original miniatures, they have produced licensed ranges based on characters from games, movies, TV and books. These included figures based on RuneQuest, Fighting Fantasy, Judge Dredd, Doctor Who, Paranoia, Eternal Champion, Dungeons and Dragons, Advanced Dungeons and Dragons, Traveller, Star Trek, Lone Wolf and The Lord of the Rings and The Hobbit. Games Workshop re-won the Lord of the Rings licence, allowing them to make The Lord of the Rings Strategy Battle Game miniatures to tie-in with the trilogy of films released by New Line Cinema, and have extended the range to include characters based on the actual writings of J. R. R. Tolkien. Citadel Miniatures sometimes release limited edition models of specific or unusual characters, such as Thrud the Barbarian, Ian Livingstone, drunken Space Marines dressed in Christmas outfits and several representing Grombrindal, the white-bearded logo of White Dwarf magazine. Along with the standard range of miniature soldiers, Citadel's lines include fantasy based war-machines, like catapults and chariots, and when Warhammer 40,000 came out, Citadel Miniatures also branched out into vehicles, such as the Land Raider and Rhino transports for Space Marines. ^ McVey, Mike (1992). Citadel Miniatures Painting Guide. Nottingham: Games Workshop. p. 1. ISBN 1-872372-61-9. ^ "News". White Dwarf. Games Workshop (11): 10. February–March 1979. ^ Masterson, Sean (January 1988). "From Sprue to You". White Dwarf. Games Workshop (97): 6–7. ^ McVey, Mike (1992). Citadel Miniatures Painting Guide. Nottingham: Games Workshop. p. 6. ISBN 1-872372-61-9. ^ "Citadel Finecast Announced;". Retrieved 2011-05-24. ^ "Wayland Games: Citadel Finecast;". Retrieved 2012-04-15. ^ "Stuff of Legends — Ral Partha History". Retrieved 2006-08-06. ^ "RTLE — Spaced Out Marines". Solegends.com. 2008-02-02. Archived from the original on 2010-02-06. Retrieved 2009-11-18. ^ "The White Dwarf at 90". Solegends.com. 2008-02-02. Archived from the original on 2009-11-29. Retrieved 2009-11-18. ^ "PR12 - The White Dwarf". Solegends.com. 2008-02-02. Archived from the original on 2009-11-29. Retrieved 2009-11-18. Blanche, John (1989). The Citadel Miniatures Painting Guide. Games Workshop. ISBN 1-869893-74-3. Citadel Miniatures Annual 2000. Games Workshop. 1999. ISBN 1-84154-031-5. "Stuff of Legends — A Brief History of Citadel Miniatures". Retrieved 2006-08-06. Citadel Miniatures Hall - A Museum of Citadel Miniatures. Citadel's page on the hobby site The Stuff Of Legends - features many scanned advertisements of Citadel Miniature's products from old White Dwarfs. CCM wiki - A site maintained by members of the Yahoo! group for research of poorly and undocumented Citadel miniatures.